I suppose bravery can be defined in a lot of different ways. 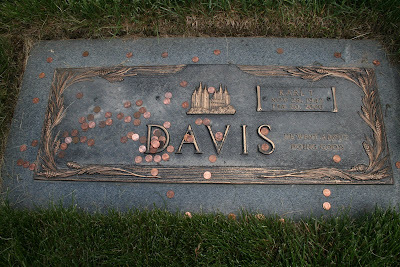 Under my definition, I think I was pretty brave when I visited my dad's grave this Memorial Day. It was my first Memorial Day visit. 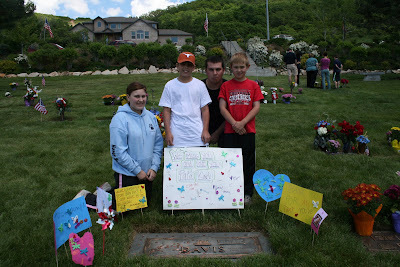 Each year, Craig diligently takes our kids to pay respects to my dad while I make up a reason why I can't go. It is a beautiful place to visit. My dad has missed a lot of things I would have liked him to see. He's missed home runs, brain tumors, school programs, school honors, dance recitals, touchdowns, baptisms, ordinations, birthdays. . . a long list if I include everything. But, it's time for me to come around a little more I suppose. After we spent a fun Memorial Day at the cabin, the five of us (me, Evan, Caroline, Sam & Isaac--Craig and Jake were at Jake's baseball game) spent a few minutes at the cemetary. I'm glad I went. It was difficult for Jake to decide three years ago whether to go to Millcreek or Mueller Park. We went with Millcreek and it was the best choice. Jake had an amazing three years at Millcreek. 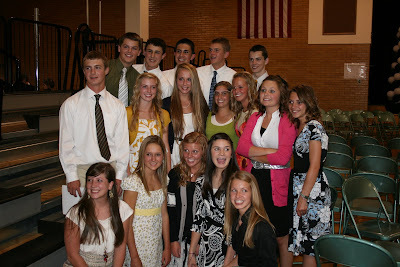 Last night was Advancement Night for the 9th graders. 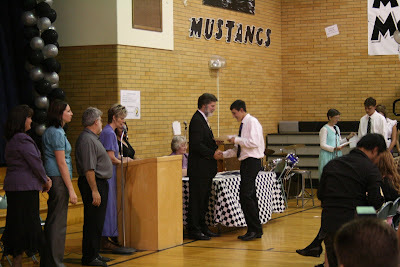 Jake was named the Most Outstanding History/Social Studies student at the school this year. I am very proud of Jake. He never does anything without doing his best. I think the friends he has made at Millcreek are amazing. They are a great group. 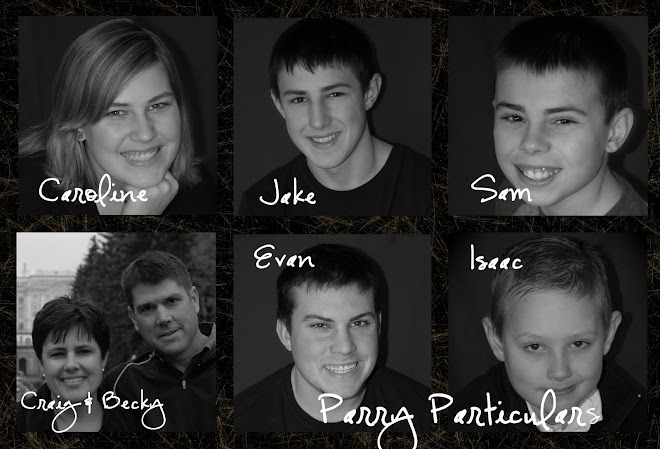 It turned out that choosing Millcreek was a life-changing decision . . . for the better! 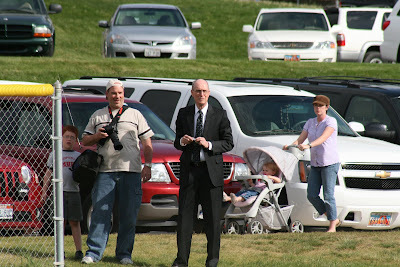 President Eyring's grandson is on Isaac's baseball team, so I don't think President Eyring came to watch Isaac, but it was sure cool to have him at the game anyway. Some of our fans had to tone it down a bit though. I'm sure all my fans (lol) probably thought we were dead, but baseball was consuming our time, our brains and our emotions. The high school is finished for now, but will pick up again when school gets out when we start playing summer ball. The season ended badly for us, Bountiful losing 12 in a row and two to Woods Cross. Evan did hit a towering home run against WX to center field. 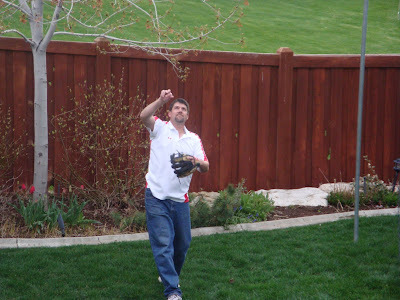 Craig found the ball across the street by the freeway fence. It was little consolation though as we lost 4-3. The first person to meet Evan at home plate after his home run was Jake. Of course, I don't have a picture of what was probably my favorite memory of the season. I'll fill in some baseball details on a later post. It was still snowing here in Utah at the very end of April. 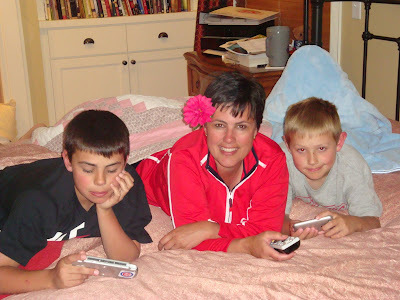 One night I went to run errands and Jake and Evan called to see when I would be home. I told them five minutes. They were delighted (which I couldn't figure out because they aren't usually that happy to see me). 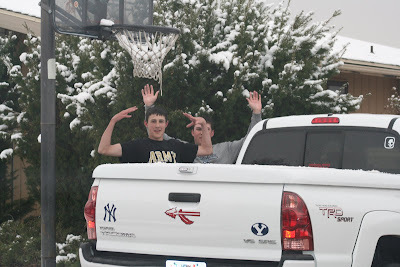 Apparently, they spent those five minutes stockpiling snowballs and then pelted me when I pulled into the driveway. So happy I had my camera with me. This is them saying they are out of snowballs--they weren't though. The barage continued until their hands were too cold to make another snowball. This is Jake at dinner. I told him that he could only have one round of milk because I'm really tired of buying seven gallons of milk a day. 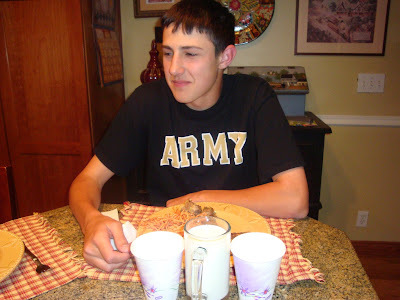 He so feared the scarcity of milk that he filled several cups at once and then spit in them so Evan wouldn't steal them. Again, glad to have a camera handy. This month was exciting for Jake because he was elected a sophomore class officer. Congratulations Jake! I enjoyed a fun Mother's Day. I slept in and then enjoyed a specially prepared ebelskiver breakfast made by Craig. After church, we had dinner at my mom's and then Sam, Icky and I watched "The Amazing Race" and "The Apprentice". I'm so happy being a mother! 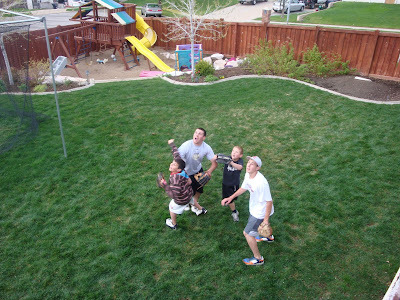 Now that it's warm again, it's "Backyard Baseball" time. I love going out on the deck on Sunday nights and watching the kids play games with Craig. Sometimes it gets rough though. 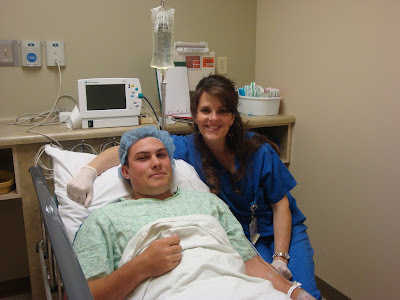 Today was Evan's surgery day. Now that baseball is over for a few weeks, we went back to the foot doctor. Evan had a stress fracture in his foot in the winter that healed before baseball season, but he aggravated it again. The doctor decided to take the broken bone out. So he squeezed us into his schedule today and the bone came out. It was cracked and really rough so it was never going to heal. Caroline fell at school and hit her head on the floor. She came home and was pretty dizzy for several hours so we took her to the ER to have her head checked out. She has a really mild concussion, but after two hours of hydration from an IV, she felt great and we headed home. 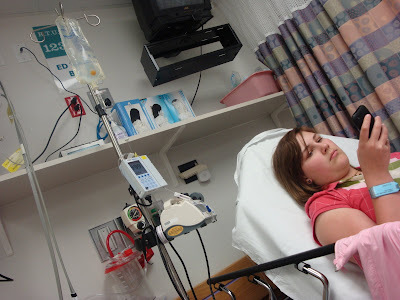 The best part for her was that they were serving salmon at the hospital that night (can't have it at home anymore because of Icky). Deep breath. Lots to do every day.